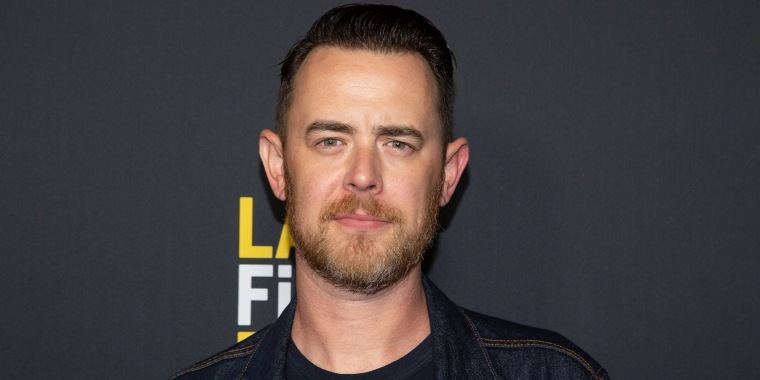 Colin Hanks loves a good pun just as much as the rest of us. So when it came time to create a catchy moniker for his new handkerchief collection, the actor channeled his comedic chops and named the line Hanks Kerchiefs. Pretty punny, right? The budding designer recently announced the new brand on Instagram, and revealed that a portion of each sale of this inaugural line of kerchiefs will be donated to help with wildfire recovery efforts in California. The actor, best known for his roles in "Life in Pieces," "The Good Guys" and "Orange County," told TODAY Style his love for handkerchiefs dates all the way back to childhood. "My grandpa always carried (a handkerchief) with him to blow his nose, When I was a kid, whenever I went to an army navy surplus store I would always buy one and my dad always had a stack of them whenever we would go on family vacations and would wear them around his neck. So, in a way, (handkerchiefs) have always been present in my life," he said to TODAY Style over email. For his new business venture, the 41-year-old teamed up with design agency Anderson Brothers to create eight patterned handkerchiefs, all manufactured in California. Hanks methodically selected a wide variety of samples, and was careful to choose a diverse range of patterns that weren't just basic paisley. "It was very important to me to have a selection that would include a kerchief for everyone, from guys and girls to models and mechanics. I was also really drawn to the idea of using different colored border stitching on some of them. I thought it would a be a cool way for some of these kerchiefs to stand out," he said. Hanks even named each of the products after someone he cares about. "My wife and kids liked specific patterns so I just named the kerchiefs after them. The pattern of the Russ Kerchief, named after Russ Solomon (the founder of Tower Records), was a bit more specific. The pattern reminded me of the carpet in the Tokyo hotel we stayed at when we made 'All Things Must Pass.' That and the pattern also looks like a stack of records," Hanks said. Each colorful kerchief is sells for $28 but you can score one on sale right now for $21. Or you can scoop up the whole collection for $200 (on sale for $168 now). After reading about the brand's cute name, one fan on Twitter suggested that Hanks could have opted for an alternate name, writing: "If it’s not too late, I’d like to pitch Colin Hankies. And preorder 200." Proving he has a great sense of humor, Hanks replied and said "Too late on the name I'm afraid. It's gonna stay @HanksKerchiefs. But I can still put you down for 200, right? or at least a couple?" Humor and design chops? Looks like Hank is one cool dude we'd like to hang out with.